We lost Darla unexpectedly just over a week ago. We’re still coming to grips with her loss. 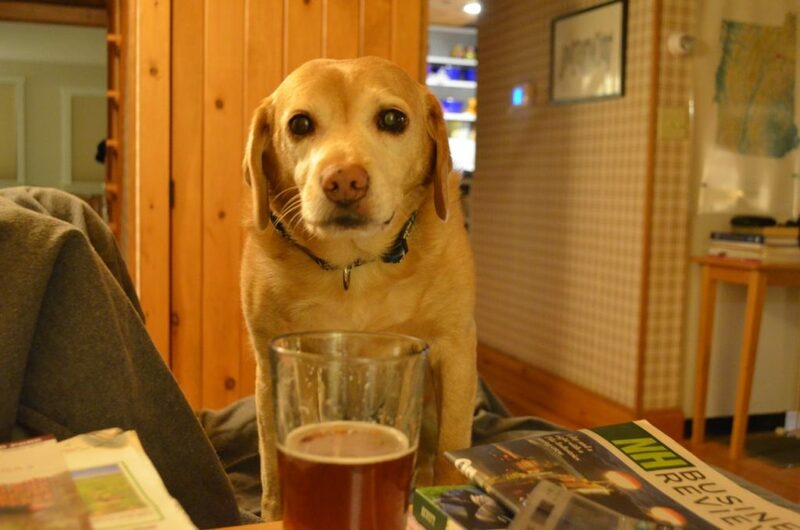 She was, as long-time blog readers know, the light of my life and yes, my favorite dog ever. She had a hold on me that no other dog has ever had. I was going to wait to write this for our next monthly blog post, but decided I needed to do it now. So here goes. I had discovered another mast cell tumor on her chest a few weeks ago, and scheduled what would have been her sixth surgery at Peak Veterinary in Burlington to remove these recurring growths. Because of her liver and kidney disease, I had our local clinic run a full blood panel on Darla the week before the surgery. The clinic emailed the results to me, and I forwarded the results to our new internal medicine specialist at Peak, Dr. Tim Bolton, who is working alongside our other internist, Dr. Marielle Goossens. I also sent photos of an odd skin thing we had just recently noticed on Darla’s lower abdomen – it looked like blood blisters under her skin, kind of like bruises. Or like a few red splotches. We thought this might be from abrasion as she plunged through our crusty, icy snowpack here. She loved bounding through the snow, and we had enough freezing rain on top of snow this winter that there were layers of ice embedded in the snow. We assumed this might be what was causing these skin patches we were seeing, because they’d come and go after a few days. I noted in the email to Dr. Bolton that the lab results said “decreased platelets” but didn’t give a score, which I thought was weird. I rushed her to Peak the next morning, and a new round of blood work showed she now had zero platelets in her blood. Not one. We were dumbfounded. She had been her usual active, energetic, bossy self, running through the snow, chasing Tanner, and demanding treats whenever she felt like it. Dr. Bolton told me that there can be a lag between the destruction of platelets and how a dog is appearing. Often, he said, there’s no indication until the dog starts bleeding. The skin bruises we saw were unusual but in Darla’s case, the initial signs of the disorder. Immune-mediated thrombocytopenia (or IMT) is obviously life-threatening and requires immediate, aggressive treatment. The first thing is to suppress the immune system to stop it from attacking the platelets. This was very risky for Darla because of her compromised kidneys and liver, and Dr. Bolton warned me that one of the complications was that we could end up making her diabetic during the course of the therapy … but we had no choice. So we began treatment that day, which involved prednisone, a one-time injection of an IV chemo drug called vincristine, and cyclosporine. We also did an ultrasound and X-rays, which showed no other internal problems. That was a Friday. The next Monday, I was back at Peak for a recheck. Her platelets were up to 15,000. Normal range is more like 200,000. So she had a blood transfusion to give her a boost, and by the end of the day she was up to about 30,000. Every other day that week I drove her to Burlington, but despite all the medications, we never got her platelet count above 60,000. A week later, it started declining again. Dr. Bolton believed there was an underlying problem that had not only caused the IMT in the first place, but was preventing her body from responding appropriately to the treatment. But in test after test, we couldn’t find anything else. A week later, Darla had suddenly stopped showing interest in food, and now was refusing to eat. I had for days been pushing the pills down her throat, because she would never take pills in food (yes, we tried everything), so I had to manually give her the medications, which she did not appreciate. Refusing to eat was a major problem in its own right, but doubly problematic because some of the medications required food in the stomach. Dr. Bolton had us add an appetite stimulant to the mix, but this didn’t change her interest in food. When I took her back to Peak on Thursday, March 9, we knew she was not doing well … but we were not expecting the news we got. Dr. Bolton came into the exam room with all the results from that morning’s tests and began reading them off to me. As I listened to the numbers, I knew what he was, in effect, telling me. Darla was in multiple organ failure. Dr. Bolton said we had options, but no good options … and while we could keep her going for a while, we’d be right back where we were in a couple of days. We went through all the possible other options, but without knowing what was causing the systemic crisis, we would just be postponing the inevitable. I looked at my beloved little girl, lying on the fleece pad on the floor. She was weak, lethargic, and wouldn’t even raise her head to look at me. She didn’t want to eat, she sure didn’t want me pushing pills down her throat, and I knew her doctor was telling me we couldn’t fix it. I knew we had to let her go. I didn’t want her to suffer and go through any more of this. Dr. Bolton left the room so I could call Alayne and tell her. We just sat on the phone together and cried. We’ve had more than our share of grief over the years — it’s what happens when you share your life with so many animals — but some losses hit harder than others. Having to let Darla go was one of the hardest losses of all. We had only had her for a few years, and we wanted so many more. Thirty minutes after the phone call, I lay on the floor with Darla as Dr. Bolton gave her the drugs that let her die peacefully and quietly in my arms. It was one of the worst days of my life. Alayne and I have been grieving ever since. Tanner, Millie and the rest of the gang are doing their best to cheer us up, but they know something isn’t right. Tanner in particular keeps looking at us with this expression that seems to say, “Well, where is she?” He and Darla were the only ones out in the living room overnight, and it’s late in the evening, when he’s alone, that he seems to notice her absence the most. 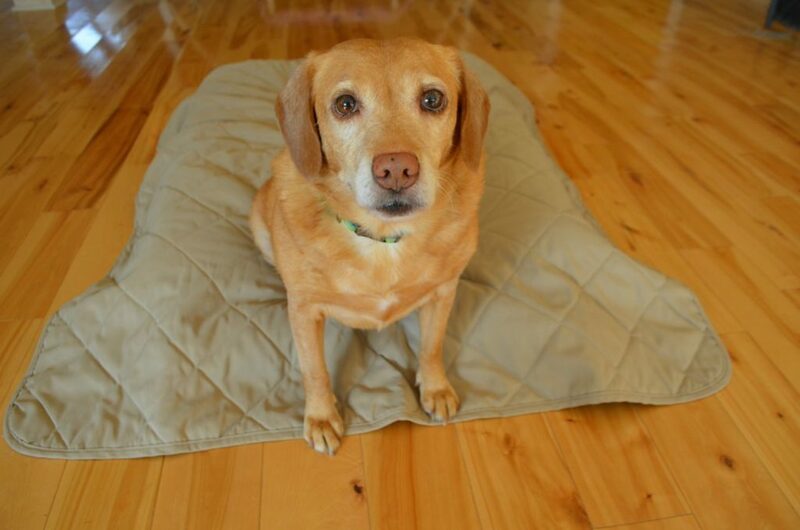 Darla had come to us as a blind dog from a Michigan shelter back in 2013. We were able to restore her vision with cataract surgery. She was the most food-motivated dog I think we’ve ever had, and that’s saying something. She used her new vision to stare at me with a laser-like intensity that made me hand over just about anything on my plate. She quickly became the princess who broke the rules and then more rules and got away with all of it. Even after I bought a new recliner so she could have the old one to herself, she insisted on taking my new one, too. She’d even try to steal my beer if I let her. Oh bless your and Alayne’s hearts, Darla knew she was loved and that she was special. Prayers of comfort for you guys. God bless you for all you do. My heart is breaking for you. The loss of any pet is hard, but to lose your heart dog is devastating. Sending you love and light to help you through it. What a beautiful tribute to your beloved Darla. I will miss her, too. Rest in peace, sweet girl. I am so heartbroken for you, I don’t think I’ve cried this much since Widget died. I have no words…..other than to say….I am so so so very sorry for your loss and grief. Thank you for giving her the most wonderful years of her life. I’m so sorry. You were able to give her a wonderful life when she came to you. Oh my!! My heart breaks for you, Alayne & the pack. It’s so, so hard to lose them. When they become so entwined in our hearts it hurts. I’ll be praying for comfort & peace to all of you. Rest In Peace, Darla. You are loved. I am so sorry. She was so lucky to spend her last years with such an amazing family, in a wonderful home, so loved and cared for. She could not have had a better and more loving home! So sorry for your loss..it is the hardest thing to go through..we just list our sweet Luci suddenly..we had her for 11 years..my heart is broken..its been a week..but it hurts as much as it did that day..we lost 3 fur babies in one week..how do you get over that…we go on knowing the love we shared is endless and unconditional and will be in our hearts for ever along with their sweet faces.. I am so sorry for your loss. You felt blessed with her, she was extremely blessed to have both of you. She could have lost her life in 2013, because of you she was given a chance. You gave her not only love, also sight, and a wonderful place to live the last 4 years. It is so hard to let go and make this decision, she is no longer suffering, although your hearts are. Thank you for helping her, and all the other creatures great and small. I’m so very sorry. I think all of us readers knew that Darla had a place in your hearts that no other animal touched. Please accept my sympathies. I’m so sorry! We’ve lost 4 fur babies since Thanksgiving and it’s always heartbreaking! Some we’d had for 17 years and others for just weeks. You’re both in my prayers. God bless you for what you do with all the animals. They’re lucky to have you and Alayne! There are no words. She was the queen and had the crown to prove it. I am so very sorry for you both and all the furry one who know she’s gone. My heart is broken for you and Alayne. I too will miss that precious face peering at me through your wonderful stories and information. Thank you both for giving the most loving home to Darla and the rest of the RDF crew. I?m sitting here at work, reading your blog and crying. I need to focus on the amazing life, love and care that you and Alayne provided to Darla. You provided her with everything needed, health care, love, companionship, FOOD!! !, and more and more love. She’s going to have a special place in all of our hearts. Bless you for the work you do? and I?m sooo sorry. I am so very sorry you lost your darling girl. Sending love and comfort to you. Oh I’m so sorry. Darla was special and you did everything you could for her. You’ll see her again one day, I know. I’m so very sorry. I’m in tears as I read. Darla will surely be missed, but , I am so, so glad she was surrounded by love in her last years. Knowing that you work so hard for these animals and care so deeply makes the world a better place. Thank you. Tears running down my face. I remember when Darla came into your “hearts” and what special care you gave her. A beautiful tribute to a special girl…who you will miss forever. Thinking of you all….. ?? Crying as I read it. So so sorry for your loss. I so enjoyed your stories on Darla and Tanner. My heart aches because those two have wrapped themselves around my heart. I am heartbroken, for you and Alayne, for the other animals, and for myself, because I?ll no longer have the chance to read about her exploits again. I?m so sorry. What you selflessly provide these beautiful being is nothing short of miraculous. They and we are all the better for it. I?m crying with you. She was a beautiful soul. Steve and Alayne – I am so sorry for your loss. I knew from the first recliner post that Darla had you wrapped around her paw. While we always wish for more time with them, at the same time we are always thankful for every single day that they bless our lives and provide us memories and love that will always keep our heart overflowing. I’m so sorry for the loss of your sweet Darla. Love and light to Darla and her whole loving family. So sorry for your loss. It always hurts so much to let go. Many of your followers have been through this too, so we understand. May you find peace knowing all you did for her. My heart is breaking for you. Darla was so special. I’m so sorry for your loss. I’m so sorry, that’s so sad, and such a hard thing to go through. I know what you mean about that one special dog, and how you can’t believe that it’s really going to end like this. It’s wonderful that you were able to give Darla back her sight, and perfectly fitting that she used it to better bend you to her will. I’ll miss her too. I’m so sorry for your loss, but you are richer for having known her and I guess that’s all we can ask of our best buddies in the end. She was a special girl allright! I’m sorry for your loss. You gave Darla the best home a dog could ever hope for, along with a peaceful, love-filled end. Thank you for sharing this beautiful tribute to her. My soul is crushed. I am going to miss seeing her photos and updates, she was one of a kind. Praying for comfort for you and Alayne. So sorry to read your blog about Darla. Brought tears to my eyes – what a sweet girl. There are no words. Praying for peace as you bear the loss. Our hearts break with yours. I cried as I read the entire article. My heart goes out to you both. Anyone who has had to “put a beloved dog down” knows the grief you are feeling. Words can’t express my sadness at Darla’s death. I can relate to your sadness and understand what you’re going through. In light of that, thank you for sharing your loss with us as difficult as it was to write about. Darla was another lucky dog to have found her way into your care, especially considering her previous abandonment. I send hugs and condolences to everyone at RDF. RIP, beautiful, spoiled Darla! We put our dog to sleep on March 9, 2010. That was the toughest day of our lives. My heart is breaking for you. I cried as soon as I saw the headline. My thoughts are with you both. So very saddened to hear about Darla’s passing. You and Alayne take such wonderful care of your animals in your care. Darla knew you were the best parents and she showed you that many times over. It is very hard to lose any animal that you take care of. Rest in peace Darla. We will miss you as you were in our hearts as well. God bless you all. I’m so sorry for your loss. I know she was special to you guys. Heartbreaking. I can only add my condolences to all the others in your time of loss. It is never easy and will take time for your hearts to mend. So, so sad. I was once told that God sends us his kids for safekeeping while they become better and better individuals. And to help us grow along with them. Once they are absolutely perfect, he calls them home to be angels. Kisses to sweet Darla. She has her wings. I am so sorry. Saying goodbye to a beloved pet is heart breaking. You gave her so much love and she to you – that’s what you want to hold on to. She is now an angel looking over you and all the animals you take care of. Darla knew love and returned that love. Carry that in your hearts and it will bring you peace. What can I say that hasn’t been said by all the readers posting their thoughts? I had tears rolling down my cheeks as I read about Darla. She was such a special dog and looking at the photo of her with her sweet face breaks your heart. She knows how much you loved her and had a wonderful life with both of you. I am very sorry for your loss. I’m so sorry that your sweet Darla is gone. She was a true character. You gave her a wonderful home and a great life. My thoughts are with you. And so I cry. For both of you, and for all of us that have lost really special companions. Run free Darla. And may your reunion with Steve snd Alayne be beyond magical in thd future. Wow. It happens we know. And it is very hard. My heart breaks for your loss. Loosing such a wonderful dog is always hard. She had a wonderful wonderful life thanks to the two of you. You two are wonderful in all that you do for every animal in your care, something all the animals in your care truly appreciate. I know she will be greatly missed by you and all of us who read your blog. Please know you are all in my prayers. My heart aches for both of you as you mourn your precious Darla. It’s an amazingly hard thing to have to keep going through over and over and especially when they are extra special to you. Praying for comfort and peace for you ……… you are still doing such good in giving these animals a greater life and a piece of your hearts. Hugs to you both. Oh, dear. So sorry. All stories about pets are ultimately sad stories. Take care. Sending much love and heartfelt condolences to you, Elaine, and all the creatures for the loss of beloved Darla? My heart is crushed as I read about Darla. Having just had to put our faithful friend to sleep as well, means having a sad connection in a way. I so enjoyed the stories of Darla and of course the antics along with the pictures. May you wrap your hearts around the memories you had for years. May you find some peace. Oh, this is the just the saddest news; I’m so very sorry for you. The day I lost my Josey was the worst day of my life, so I know just what you mean. Thinking of you, and wishing you strength and peace..
What an amazing 4 years Darla had with you. My heart goes out to you ~ be gentle with yourself.